Our community has been thriving for more than 30 years. The values we live by are love, responsibility, teamwork, honesty and friendship. This program gives you the opportunity to become part of the Humaniversity family by sharing your skills and working in our community. The focus of the Community Experience Program is work as meditation. Becoming aware of how you are participating, instead of just the results of what you are doing, brings a new dimension to your life. Everything you do and everyone you meet becomes a reflection of who you are and how you can grow as a person. We work out all practical problems as well as the personal differences between us. Heartful commitment to what you do, not because you have to but because you care, is fulfilling. Our approach is that work is love made visible. Because our work, our therapy and our community are so intertwined, it is important that before joining the Community Experience you first participate in one of our therapeutic programs to get to know us and our way of working with people. We recommend starting with the 14-day Tourist Program. You can join our community in many different areas such as cooking, painting, carpentry, web and graphic design, music, administration, gardening and archiving. You will also be able to join in a selection of meditations and sessions from the Humaniversity program. Three times a week we hold OSHO Dynamic Meditation in the morning. Once a week you will join our famous AUM Meditation together with the whole community. Twice weekly you'll have an hour of the workday to explore yourself with others in an activity of your choice such as exchanging individual sessions, meditating, jogging or playing music. In the evenings you can participate in martial arts, massage, creativity or emotional release classes. One evening per week is set aside for a personal sharing with the other workers. After the evening activities you are welcome to relax and socialize in our nightclub, sauna or coffee shop. Once a week you will have a day off for yourself. Favorite activities are going for a walk on our beautiful beach, exploring the local nature reserves or day trips to Amsterdam. We welcome you to be an active participant in our family and contribute your skills to making our home the most beautiful community possible. 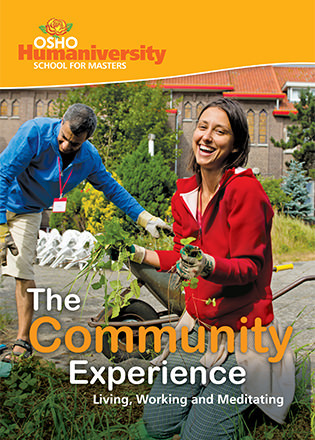 The Community Experience Program runs all year round.